Putney’s Exchange Shopping Centre shut at 2pm today, as did the Centre Court Shopping Centre in Wimbledon and several other stores in the area following rumours rioters were planning to launch an attack at 5pm. The station was opened by the Metropolitan District Railway (MDR, now the District Line) on 3 June 1889 on an extension from Putney Bridge station to Wimbledon. The extension was built by the London and South Western Railway (L&SWR) which, starting on 1 July 1889, ran its own trains over the line via an eastward-facing loop that joins the Clapham Junction to Barnes mainline. The section of the District Line from Putney Bridge to Wimbledon was the last part of the line to be converted from steam operation to electric. Electric trains began running on 27 August 1905. Mainline services through East Putney were ended by the Southern Railway (successor to the L&SWR) on 4 May 1941, although the line remained in British Rail ownership until 1 April 1994 when it was sold to London Underground for the nominal sum of £1. Until the sale, the station was branded as a British Rail station. A short walk from East Putney is the bustling Putney High Street where you can find shops including Argos, Next, Gap, Foxtons (estate agents), Waitrose, Game and Block Buster. 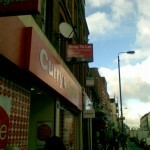 Our roving secret shopper reports that Currys.Digital in Putney is having a closing down sale. Also going is Parchment in the High Street. We also hear that both Starbucks and Argos are closing down . The Argos lacks visibility, and since most people can not afford to ‘buy the Moon” few can afford the bucks for a star. There a few items which are on “clearance” in other branches as well, but nothing specific. East Putney Scout Centre is wholly owned and operated by 1st East Putney Scout Group. A very competitive rate for hire is available and enquiries are welcomed. The hall offers ladies and gents toilets, heating, tables and chairs and rudimentary kitchen facilities. Near by attractions include Fulham Palace, Craven Cottage Fulham FC and the Putney Odeon cinema. There are numerous restaurants and bars in the area. East Putney is located in the London Borough of Wandsworth.